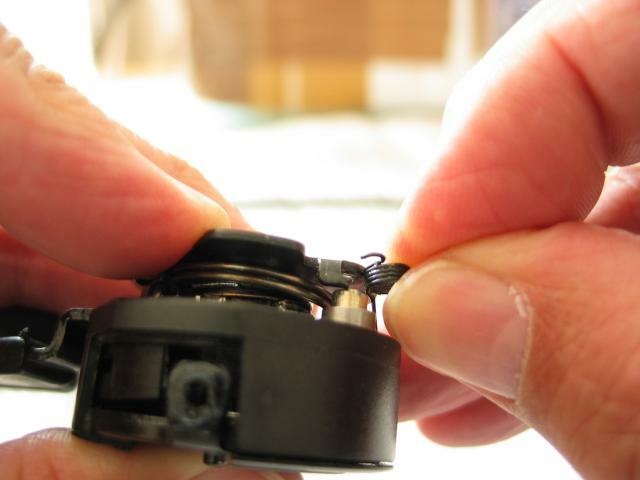 Installing the holding pawl return spring. This is one of the more finicky steps in the shifter assembly process. While holding the top plate down with your subordinate (left, for righties) hand, but leaving a gap above the holding pawl pivot, use your dominant hand to push the spring sideways into place. As shown in the photograph, the upper hook on the spring should be positioned so that it catches the tab on the top plate. The lower tab on the spring will then nicely catch the slot on the pawl. When the spring is in position, press down slightly on the top plate and the spring will slide down onto the pivot. Then install the top plate screw, but do not tighten it.